In Somaliland, democracy means a form of popular government in which the power is held directly or indirectly by the citizens via a free election. As first free and fair democracy in East Africa, Somaliland has a tradition of promoting democracy, liberty, equality, freedom of worship and expression. Somaliland held more than one election starting with Referendum Election on the Constitution of Somaliland, which defines the independence and integrity of Somaliland Republic in its first paragraphs. Somaliland received financial support from free world in the process of organizing the elections, including European Union that sponsors the expenses of 29th March 2009 Presidential Election. United States of America, EU, Great Britain, African Union…etc all called for support to Somaliland democracy and Multiparty system, which is rare in Africa. Democracy analyzers ranked Somaliland on third place after South Africa and Ghana in free and fair democracy in the black continent. In 2003, UDUB, the ruling party, won with 80 votes over strong Kulmiye party. The upcoming election may surprise many people and change the leadership of the country. UDUB Chairman and President of Somaliland Dahir Riyale Kahn know the challenge waiting him and his party in next election. He promised to lead the country for another five years, as the constitution of Somaliland allows only two terms for each leader. The Kulmiye leader Ahmed Siilanyo vowed his supporters win in next election. In other hand, UCID party plays very vital role because its support is necessary to both the strong contestants – UDUB and Kulmiye. UCID formed opposition coalition with Kulmiye party in last parliament election, which earned UCID the Parliament Speaker Seat. Also, both bigger parties UDUB and Kulmiye need the support of UCID to cross dividing line and form the next government. It is very much expected that result will be tight. Somaliland Election Commission is an independent, and constitution gives full authority to carry out the election without need of any political party. The commission executes all its operations without referring the cabinet of ministers, and elects its administration body and chairman between the board members of the commission. What is highly new in Africa is the Biometric Voter Registration in Somaliland, where fingerprints of all citizens are saved in centralized database. This eliminated the duplication and identifies Somalilanders from other regional population. Biometric Voter Registration is first time in the history of Africa; even the rich African countries like South Africa don´t have such splendid technique to support democracy. Diplomatic impediment is hampering Self-sufficient Somaliland efforts towards statehood. Somaliland needs to do business with international community and play vital in peace and human rights restoration in the world. If no diplomatic support, Somaliland democracy will die between search of sovereignty and international stubbornness on its cause. When the regime of Siad Barre was ousted from power in Somaliland in 1991, the long waited dream of Somalilanders was finally realized with the return of their lost integrity and prompt filling of the power vacuum left by General Mohammed Siyad Barre – the regime that destroyed the unity of the Great Somalia, which was a combination of British Somaliland and Italian Somaliland after gaining independence in 1960. In British Somaliland, the colony meant a marginal importance to the British Empire and was used merely as a logistical supply outpost for British ships sailing to India or to the Gulf of Aden. The British colonial praxis then could best be described as indirect rule and, as a result of this soft approach to indigenous political systems, the traditional order stayed largely intact. The older and intelligent Somaliland generations signed an agreement with British in Yemen refusing to sign a Memorandum of Understanding – MoU with a foreign party on their own soil. 1. Pregnant British women should not deliver their babies on Somaliland Soil, as per the understanding that the child has the right to hold the Somali nationality since he is born on Somaliland territory. 2. No British or accompanying foreigners including Indians will be allowed to bury their dead in Somaliland without obtaining a permit from the local council. 3. British citizens should not socially interact with Somalilanders including marriage. 4. British citizens should establish their own residential community separate from Somalilanders. 5. British citizens should not interfere with Somaliland´s religion, much so, propagate Christianity. 6. Educational institutions that will be established in Somaliland by British parties should gain the support of the local council. 7. British citizens should be considered as guests, not as colonizers. 8. British citizens should leave Somaliland anytime the people of Somaliland ask them to go. These are some of the terms and conditions specified in the agreement signed between Somaliland elders and Her Excellency, the Queen of England and Wales representatives in Aden – Yemen. The agreement was written on animal skin, which still remains in the hands of the Somaliland elders today. Our Senior Citizens who signed such an agreement with the British were either not educated or had no experience of signing high profile MoUs. Somalilanders adopted the problem solving techniques of the elders who resolved issues under the trees. The Somaliland modern democracy is nothing but a product of these traditional problem solving techniques. After Somaliland was declared, clan leaders and elders in Somaliland gathered in a traditional meeting and proclaimed Somaliland independence in May 1991 at Burco City. Guurti (Upper House of Parliament in Somaliland) is a traditional conflict solving body in Somaliland, which has succeeded in bringing law and order in the country. Since then, Somaliland can be regarded as a democratic and stable region. With minimal foreign aid, it has managed significant progress in its effort to consolidate statehood. In a nationwide referendum held in 2001, the country introduced a new constitution with overwhelming 97% of support. In April 2003, voters were again called to the polling stations for the election of a new president. The ballots in which Dahir Riyale Kahin was elected as president were moderately free and fair. Opposition Parties Leaders Ahmed Mohammed Siiraanyo of KULMIYE and Eng. Faisal Ali Waraabe of UCID lost against Mr. Kahin in a historic, unique and democratic manner and readily accepted the result of election. The consolidation reached a climax at the end of September 2005 when the country held parliamentary elections. International observers from South Africa, UN, I.G.A.D and AU called the elections free and fair. Furthermore, more voters turned out to elect candidates from different clans, a clear signal that Somalilanders are beginning to trust their political system. But the consolidation of statehood has so far not been followed by international recognition from the international community. Meanwhile, the question of Somaliland's independence has created a row between the two former colonial powers of Somalia, Italy and Great Britain. Italy has strongly emphasized the importance of Somalia's unity and is subsequently supporting the T.F.G. headed by Abdullah Ahmed Yousif. 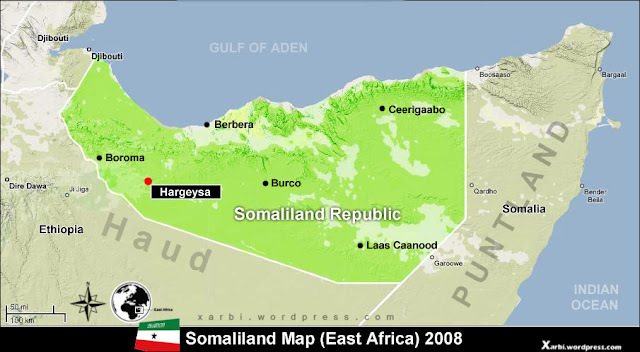 Unfortunately, Britain´s support to its former colony has dwindled and sometimes rejected Somaliland´s claim of independence. Britain is the only country in the world, which is fully aware of Somaliland´s history particularly after gaining independence on the 26th of June 1960. Britain knows that over 34 countries have recognized Somaliland since its independence from the UK in 1960. Although Somaliland managed stability and continuity through its democratic policy, its foreign policy has been paralyzed by diplomatic embargo against Somaliland, where the international community realizes process, democracy and statehood in Somaliland but still remains blind and even refuses to hear the Somaliland voice of freedom. In 2007, Somaliland diplomacy started shinning after Rwanda Minister of Foreign Affairs Dr Charles MURIGANDE highlighted Somaliland development followed by a lecture delivered by Somaliland Minister of Foreign Affairs Abdullah Mohammed Duaale in the last AU Foreign Minister´s meeting. I.G.A.D. is committed to Somalia's unity fearing that a successful secession of Somaliland could be misinterpreted as a precedent of other secessionist movements in East Africa. Arab countries are trying to balance Ethiopia's influence in the Horn. Yemen, for instance, supported Jama Ali Jama, a rival of Yusuf in Puntland, as Yusuf is regarded by many Somalis and Arabs as too attached to Addis Ababa. According to Arab theory, United Somalia is only a factor to balance Ethiopian military presence in east Africa, which forces them to throw the Somaliland case of independence in a dustbin. Yemen serves as an important transport hub for small arms to TGS ailing President Abdullah Yousuf Ahmed of Somalia despite a United Nations arms embargo (before it was lifted). Furthermore, Ethiopia builds muscles of TFG President Abdullah-yey regime, with its subject of exercise being perceived as against Somaliland. The mature politics of Ethiopia was instrumental in maintaining good relations with Somaliland as well as with Yousif and the T.F.G. Ethiopia utilizes Somaliland Ports after Djibouti and Eritrea sliced it off the coast of the red sea. Currently, Berbera Port is the only sea access to Ethiopian business and government supplies, because Somalia ports remain vicious and perilous for Ethiopian use. Djibouti, on the contrary, feels uneasy to have modern and democratic Somaliland in the region, and Djibouti doesn't want to promote a business competitor for its main source of revenues – port revenue collections is the backbone of Djibouti economy. The government of Djibouti enjoys a very peaceful border with Somaliland. US sources, in the Economist December 2005 issue, hinted that Italy is funneling weapons to the provisional government despite a United Nations arms embargo. Britain, as the former colonial power of Somaliland, is said to develop a much more open approach to Somaliland and has repeatedly encouraged Hargeisa's process of democratization. The United States also pursues a more open approach. The U.S. State Department announced that it "welcomes the September 29 parliamentary elections in Somaliland." Furthermore, US based Center for Strategic and International Studies issued a number of recommendations to strengthen U.S.-African policy, describing Somaliland's capital Hargiesa as a strategic location in the global war on terror and criticized the lack of a U.S. presence in the area. Conclusion: Although Somalilanders voted for their independence and exhibited their right of self integrity, the latter is still a victim of ongoing conflict on the international diplomatic embargo. The International Community is deeply divided on the issue while I.G.A.D is unable to endorse any solution. Somaliland´s future rests to be seen besides Somalilanders commitment to continue with or without support from the international community.